Harry was an original member of the unit, aboard SS Zealandia on 8 Dec 1941 for Timor as a Signalman in the Signals Sect of Headquarters. After the campaign on Timor, he embarked with the unit for Australia aboard the Royal Dutch destroyer Tjerk Hiddes on either 11 Dec 1942 or 16 Dec 1942, as the embarkation rolls do not differentiate. 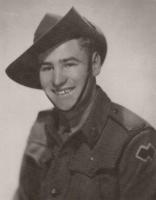 Harry embarked with the unit for New Guinea aboard SS Duntroon on 17 Jun 1943 as a Corporal in the Signals Sect, Headquarters and returned to Australia with them aboard Taroona on 3 Sept 1944. After leave and reorganisation, he embarked for New Britain aboard Taroona on 9 Apr 1945 with the unit as a Corporal attached to B Troop. He was discharged on 8 Jan 1946.